If you are looking for information on the Ranch 1 franchise business opportunity, Ranch 1 chicken franchises or Ranch 1 grilled chicken franchising, then you have come to the right place. Welcome to Ranch 1, home of "the best grilled chicken on earth". A healthy, delicious alternative to fast food, Ranch 1 features sandwiches made with premium quality chicken breast, flame-grilled to perfection, topped with gourmet greens, toasted almonds and our famous roasted red-pepper sauce - all served on a fresh-baked, semolina roll. The taste our customers want, without all the fat. As a New York City based quick service restaurant chain franchise, Ranch 1 focuses on quality, taste, and value combined with the convenience of fast service and the appeal of a healthier menu. The first Ranch 1 opened in 1990 in New York City on Broadway next door to the Late Show with David Letterman. Since then we have experienced rapid growth. The company is currently over 50 locations strong with additional locations opening soon. 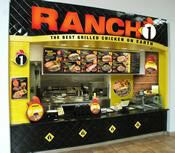 Ranch 1 is looking for qualified individuals or groups to help expand this chain nationwide. Franchise opportunities exist for both single restaurants and multi- unit development. As part of Kahala Corp's portfolio of innovative quick-serve restaurants, Ranch1 is supported by an aggressive commitment guaranteed to put it at the top of the fast food pecking order. Our simple operation featuring proprietary recipes is marked by high-speed service, a sensory-centric environment in which guests can see, smell, and hear foods sizzling on open grills, and an intriguing menu of specially prepared dishes offering an appealing and tasty alternative to conventional fast foods. Architectural, construction and engineering assistance. A national purchasing program and equipment selection. Ongoing advertising and marketing support. Continued operational support and assistance. Ongoing product research and development. Quality control reviews and evaluations.